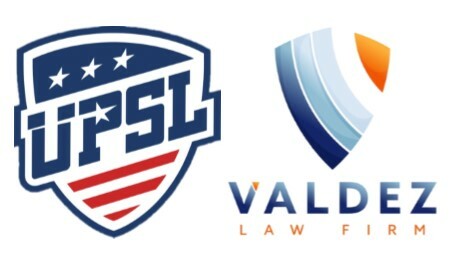 LOS ANGELES - Nov. 7, 2018 - PRLog -- The United Premier Soccer League (UPSL) is excited to announce a corporate partnership with Valdez Law Firm. Valdez Law Firm is dedicated to representing clients in deportation and removal proceedings, including litigation in Federal District Courts, Federal Court of Appeal, Immigration Courts throughout the United States, and Board of Immigration Appeals. Valdez Law Firm has successfully represented both businesses and individuals in seeking immigrant and non-immigrant visa through the United States Citizenship and immigration Service and various consulates throughout the world. As part of the sponsorship, UPSL clubs have access to Valdez Law Firm's myriad of immigration law services. For immediate service contact Marketing Director Damian Salazar or Marketing Agent Ricardo Salazer at 1-310-330-0511, or by e-mail at ricardogarcia@valdez-law.com. United Premier Soccer League Commissioner Yan Skwara said, "The UPSL is melting pot of players and coaches from all over the globe, and soccer is a vehicle of passion and balance in many of our players families' lives. We are very pleased that the UPSL is able to serve our players, coaches and their families through this partnership with Valdez Law Firm, which aims to provide proper legal guidance and representation to anyone seeking legal immigration status." Valdez Law Firm Marketing Agent Ricardo Garcia said, "We're excited to partner with the UPSL, and the unique thing we do is we give free immigration consultations, and we'll be giving free immigrations consultations to UPSL players and supporters. We'll be able to tell anyone referred to us what they should do regarding their immigration status, and what options they have going forward." The UPSL is in more than 75 different key soccer markets across 38 states, servicing thousands of players, coaches and employees. Established in 2018, Valdez Law Firm is committed to providing the very best representation to foreign nationals throughout the world. Valdez Law Firm representation is founded on thorough analysis of a clients' immigration work, and diligent prosecution of all tasks necessary to meet the clients' objectives. The UPSL was formed in 2011 and currently includes more than 300 teams in Alaska, Arizona, California, Colorado, Florida, Georgia, Idaho, Illinois, Indiana, Iowa, Kansas, Massachusetts, Michigan, Minnesota, Missouri, Nebraska, Nevada, New Hampshire, New Jersey, New Mexico, New York, North Carolina, Ohio, Oklahoma, Oregon, Pennsylvania, Rhode Island, South Carolina, Texas, Utah, Virginia, Washington and Wisconsin. UPSL is the fastest growing Pro Development League in the USA, with 400-plus teams targeted for 2019 Spring Season. Each UPSL team is individually owned and operated, and is responsible for maintaining either UPSL Pro Premier Division or Championship Division minimum standards.